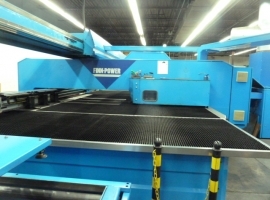 FINN-POWER SG 5 TRS5 SBU/AM puncher and nibble machine integrated with angle shear for plate format 2530 x 1270 mm. The stable construction at FINN-POWER Shear Genius causes high shaft speed and acceleration combined with high precision, effective production, high quality and low tool costs. The angle shear offers lot of benefits compared with the nibble and puncher machine with no angle shear. 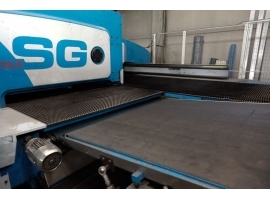 The production can be 10 – 25 % faster and the plate utilization 10 – 20 % better. FINN-POWER puncher unit have a punching capacity up to 8 mm steel and 5 mm stainless steel. 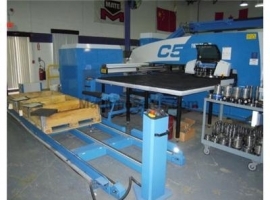 CNC-steering Sinumerik 840 D with 15” screen. 3 pcs. collets with pneumatic central lock. Automatic positioning of collets (PCS). 1 piece scrap conveyor SC 1. 1 piece scrap conveyor RCS 1. 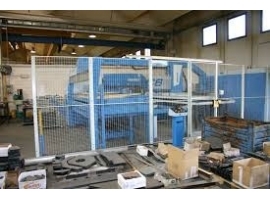 Forming with 1 piece forming station. Necessary lightning grid and security fences. Integrated angel shear RS 1500. Shear Genius is equipped with a conveyor band that removes the cut-out detail from the shear. The band conveyor sorts scrap and cutted details. 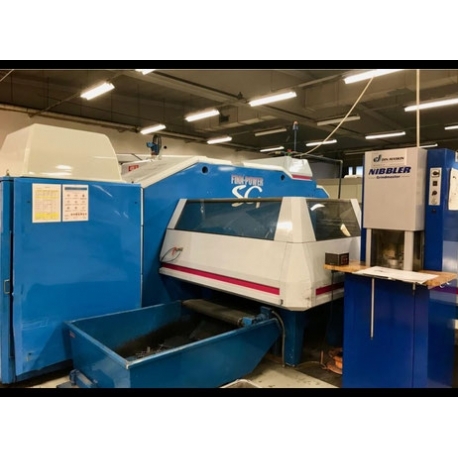 The cut-out details can be sorted and stabled with FINN-POWER sorting system type C 1500. One station feed table, max. 3000 kg. Separation magnets and plate separation. Plate weight max. 180 kg. Plate thickness minimum 0,5 mm. Suction, programmable zones for suction cups. Max. plate thickness 6 mm. One piece FINN-POWER Jetcam SG Expert 3 software inclusive automatic nesting functionality.